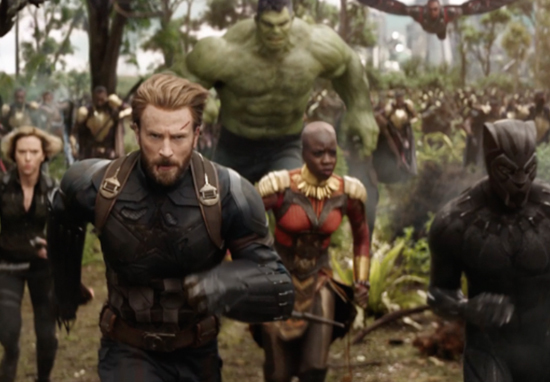 Many Marvel fans are still in firm denial about certain catastrophic events in Avengers: Infinity War; unable to believe so many of their favourite heroes have been lost to the forces of evil. There’s a heck of a lot of fictional grief to work through and the Marvel Cinematic Universe will never be quite the same again. All great things must come to an end, but for many, there’s just been too many endings to take. Ashes to ashes, dust to dust and all that (cries hysterically). Now, it’s fair to say Idris Elba hasn’t always had a lot of love for his character, Asgardian gatekeeper, Heimdall, and at times, has even appeared to resent his time spent in the Marvel Universe. I’d just done eight months in South Africa [filming ‘Mandela: Long Walk to Freedom’]. I came to England and the day I came back I had to do reshoots on Thor 2. I’m actually falling down from a spaceship, so they had to put me in harness in this green-screen studio. And in between takes I was stuck there, fake hair stuck on to my head with glue, this f-cking helmet, while they reset. And I’m thinking: ’24 hours ago, I was Mandela’…I was literally walking in this man’s boots. [Within] six months, the crew, we were all so in love with this film we had made. I was Mandela, practically. Then there I was, in this stupid harness, with this wig and this sword and these contact lenses. It ripped my heart out. I wish I was more present in the Marvel family. I like what I have, but I also wish that I had a bigger character in the Marvel universe. It’s been great, but I kinda think I need a bit more. I want to be a superhero. I like the idea of that. Nowadays, it seems Elba has real affection for the all-seeing Heimdall and is sad to be putting those cool contact lenses back in the bathroom cupboard. His gutted fans rushed to show encouragement, raising a tearful toast to The Watcher of Worlds. You were awesome…I love your performances…thank you. You were fantastic in that role, as is the case with basically everything I’ve seen you in. Keep it up, my dude!